Andrea Ayres-Deets is the Lead Writer at Crew, an invite-only network connecting short-term software projects with handpicked developers and designers. Andrea writes about psychology, creativity, and business over on the Crew blog. I spend all day on a computer. No, wait, that’s an understatement. I spend nearly every waking hour of every single day in front of a digital device. By 4:00 p.m. my eyes are dry, bloodshot, and begging for relief. They are out of luck though because I have maybe four or five hours left of work here. When it’s really bad, I can actually hear myself blinking. The majority of us spend all of our work and free time in front of one form of digital device or another. It’s not difficult to protect your eyes from damage caused by the light emitted from screens, it just requires some knowledge and minor adjustments. How long do you spend in front of a screen? Four hours, Seven hours, more than ten? Most of us spend around 6-9 hours a day on a digital device, another 28% spend more than ten hours a day in front of one type of screen or another. Your eyes can begin to feel strain in as little as two hours. It doesn’t matter how old you are or how good your eye sight is, all of that screen time isn’t good for you. The eyes clean and moisten themselves each time you blink. Computer use reduces your blink rate by as much as five times. When you are on a computer you also more likely to have incomplete blinks. That is when a blink does not fully cover the cornea of your eye. This can result in eye strain, fatigue, and headaches. Light influences everything from our hormone secretion and heart rate, to our cognitive abilities. When we get too much, or not enough of the good kind of light, these biological and behavioral processes are effected. First things first, what happens when light first hits your eyes? Cornea and Lens: responsible for absorbing much of the UV light that enters our eyes with the lens absorbing most shorter wavelength light. Macula: absorb around 40% of high energy blue light. 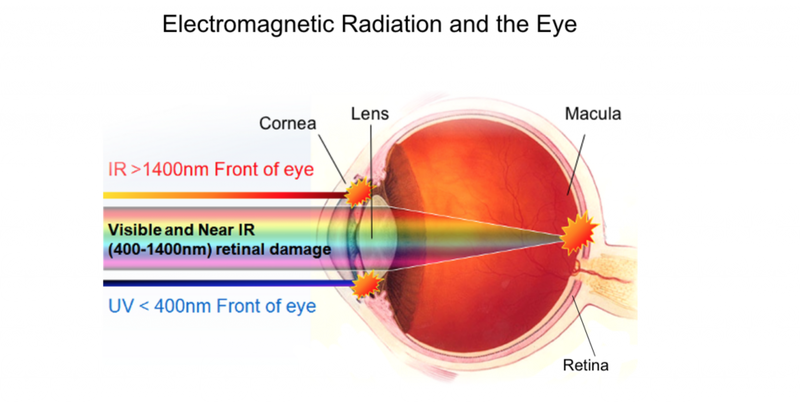 The cornea, lens, and macula absorb electromagnetic radiation up to 460 nanometers (nm). Anything above 460 nm—like light from your computer screen—cannot be absorbed and that’s a problem. The 460 nm—1400 nm range is known as retinal hazard region. Light in that range goes directly into your retina and that can cause damage. Blue light (or high-energy visible light) is bad for you when you are trying to sleep and it’s equally bad for you when you are working. All of your electronic devices give off this high-energy visible light (HEV). 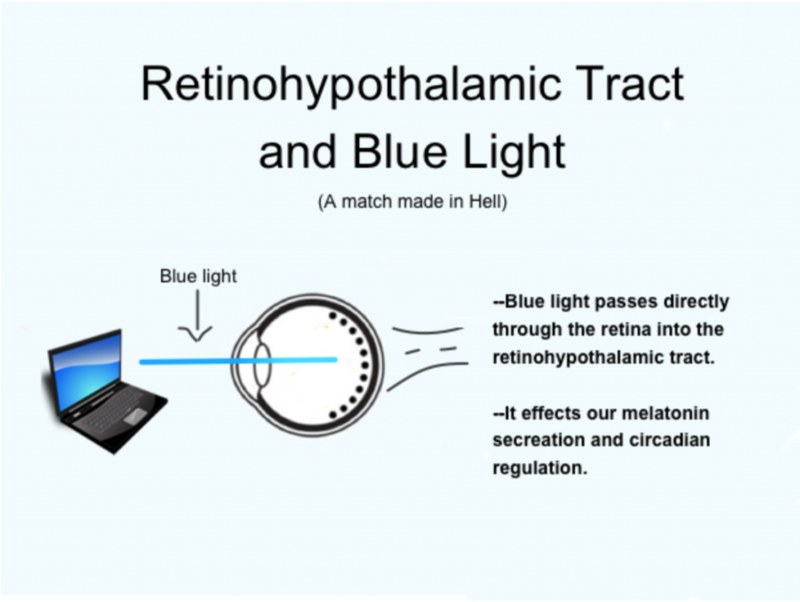 Blue light is able to pass through what is called the retinohypothalamic tract, or pathway. This pathway is responsible for regulating our circadian rhythm a number of other biological and behavioral processes. Because of how sensitive our eyes are to blue light, it is believed that it effects our behavioral and biological processes more than other types of light. So these rhodopsin are normally purpley-reddish in color, but when they are hit by light, they bleach. 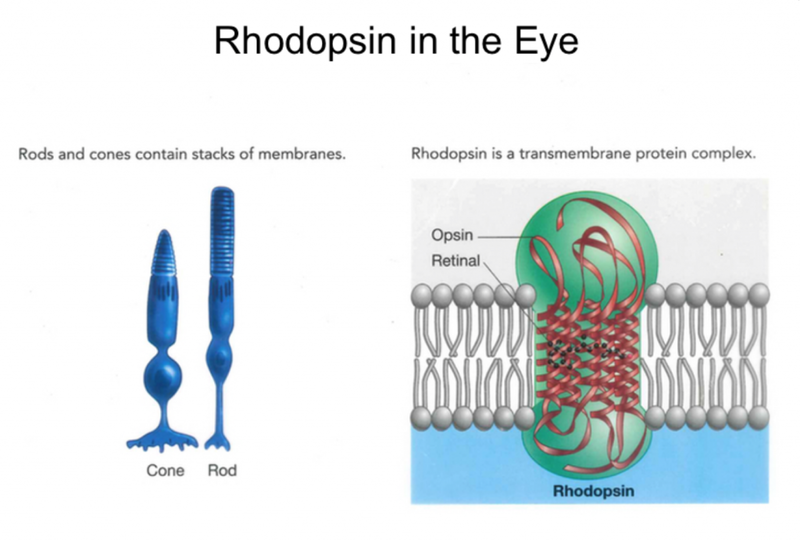 Rhodopsin decomposes when it is exposed to light, the bleaching is rhodopsin being changed into another compound. It is only when you remove yourself from light that they regenerate into new purpley-reddish proteins. This is the natural cycle and it needs to happen in order for your vision to work properly. Blue light causes rhodopsin to regenerate photochemically (meaning it happens in the presence of light instead of in its absence). 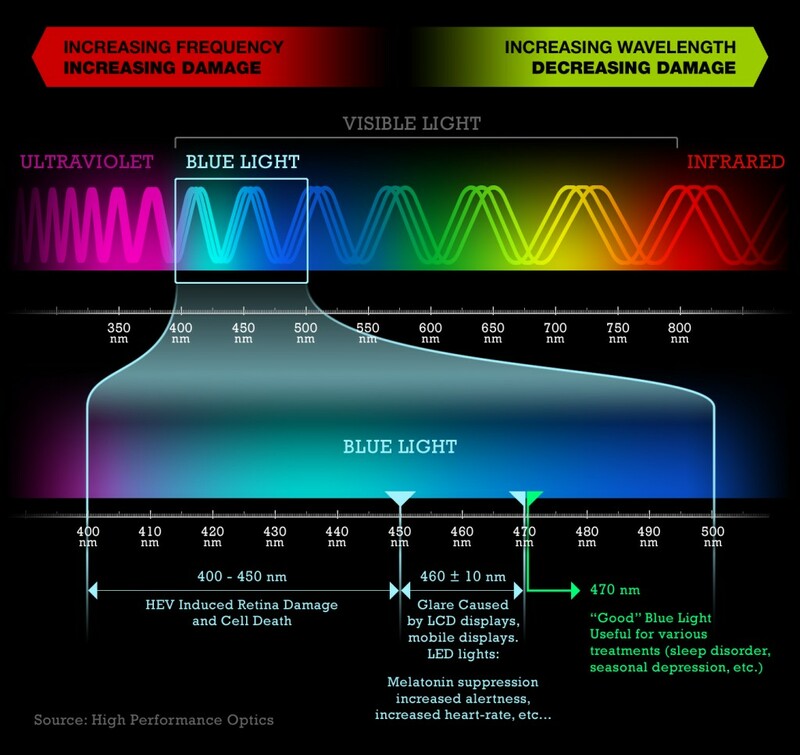 The blue light causes your rhodopsin to become unbleached very quickly, much more so than when it occurs naturally. This allows more light to enter the retina before it is ‘ready’ which can cause damage to the sensitive cell tissue in your eyes. So you take the cumulative effects of blue light and regular light and what you are left with is a big old mess. Our eyes don’t need any more help with wear and tear, it happens naturally as we age. Digital devices can compound and intensify this damage. You want your computer screen to be the brightest thing in the room. If it’s possible you want to have your light mimic that of a fire, this means turning off or reducing overhead lights. Make sure that your desk laps (task lighting) is setup to provide you with indirect light, you want your office space to have as few ‘bright spots’ as possible. Glare usually means there is one spot on your screen that is particularly bright. Your eyes have trouble adjusting to the brightness of the glare with the rest of the screen which can result in discomfort. You could ask your employer for one of those handy-dandy anti-glare computer screens. If that’s not your style make sure your computer screen is away from a window and clean it regularly. You should definitely avoid exposing yourself to blue light at least 2-3 hours before bed, as it disrupts your circadian rhythm. 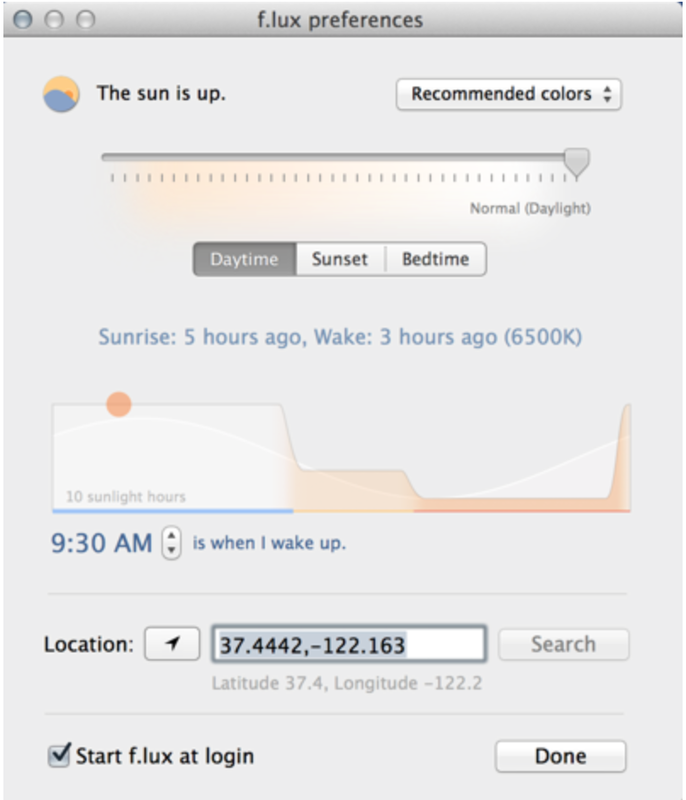 During the day you can try programs like flux which adapts the color of your computer screen to the time of day. 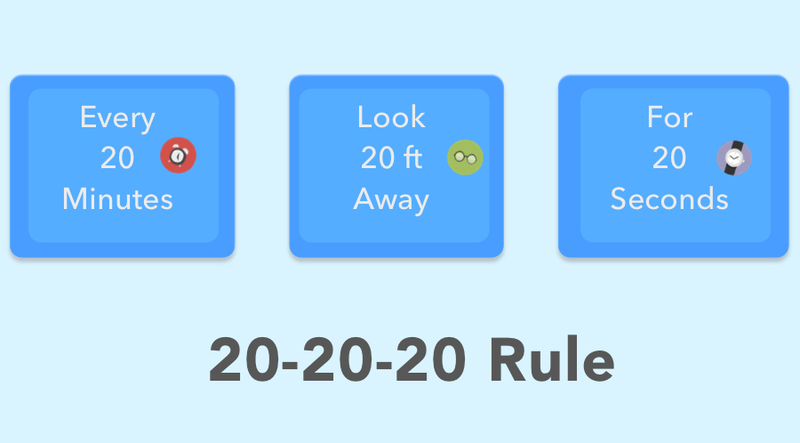 Look away from your computer or screen every 20 minutes and focus on a distant object at least 20 feet away for at least 20 seconds. 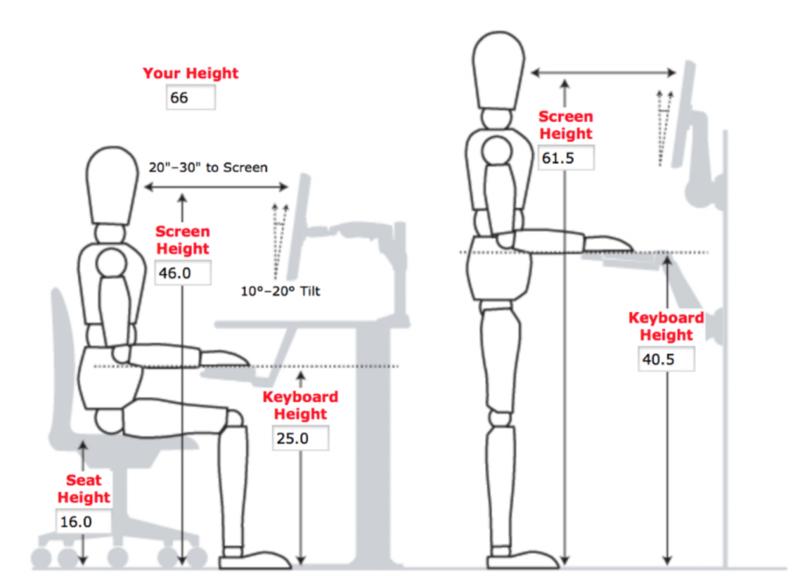 Most of us have our desks setup completely wrong, I’m especially guilty of this. I like to scrunch my neck up and hunch over my screen like a ghoulish fiend. Unsurprisingly, this is bad for you. Retinal is processed vitamin-A, and retinal is essential to the process your rhodopsin goes through when you perceive light. The average human needs between 700-900 micrograms per day…or 5,000 International Units (IU). Sweet potatoes, carrots, leafy greens all have high levels of vitamin A in them, so get to noshing. If your eyes feel tired, it’s not just you being annoyed with your work. That means that are actually tired. Don’t try to write off eye fatigue as something else because like most health issues, this one isn’t likely to get better when ignored. If you feel eye strain or headaches, take a break. Try blinking slowly for ten times to re-wet your eyes. You can also trace a figure-8 pattern with your eyeballs, and cup or palm your hands over eyes. The idea is to give your eyes some variation which can provide you with some relief. Try to have regular eye exams to keep track of your eye health and note any changes in your vision. You could also look into buying some computer glasses, but having an eye exam first will help determine your need for such gadgetry. And please, remember to wear some sunglasses when you are outside too. After I finished research for this article, I may or may not have immediately done the following: purchased computer glasses, drank a ton of carrot juice, purchased lubricating eye-drops, and installed flux on my computer. Overboard? Perhaps. If there’s anything I can do to help protect my eyesight, even a little bit, I figure it’s worth a shot. We all want to work hard, but we shouldn’t have to sacrifice our health in order to do so. Making some of the changes I listed above can ensure that you can both work hard and protect your eyes at the same time. Woot! Read next: 10 Mac apps in 1 bundle – name your own price. Come and get them!